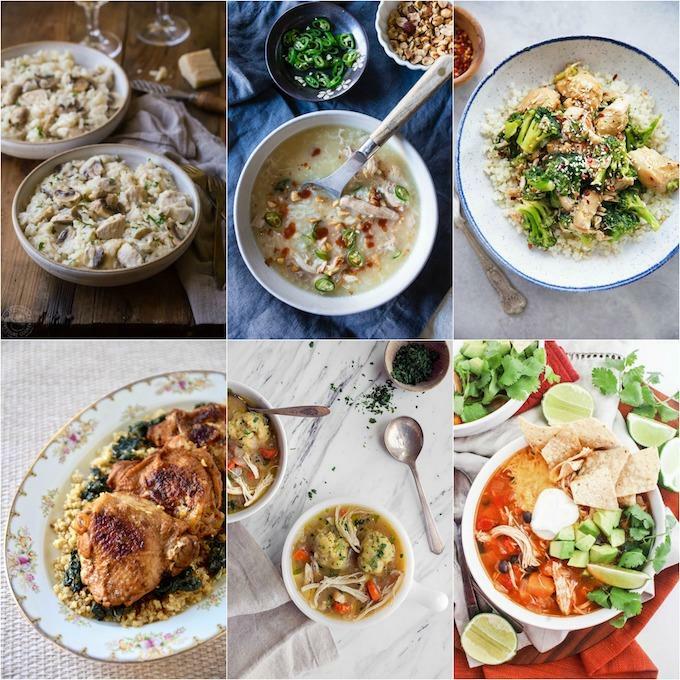 These Instant Pot Chicken Recipes are perfect for easy, healthy dinners. Plus you can pack the leftovers for lunch! And many can be made in the slow cooker if you don’t have a pressure cooker. 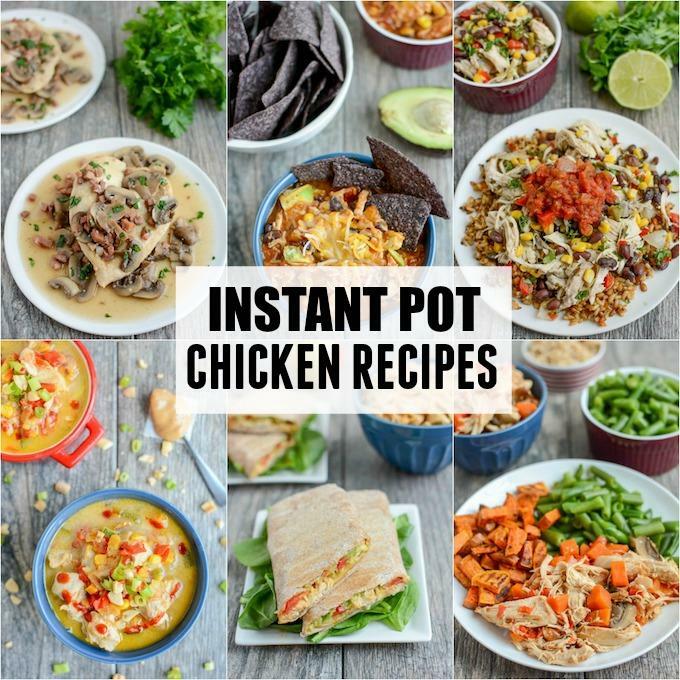 Welcome to this delightful little roundup of Instant Pot Chicken Recipes. One of my goals for the next few months is to put together some helpful roundup posts for you guys. 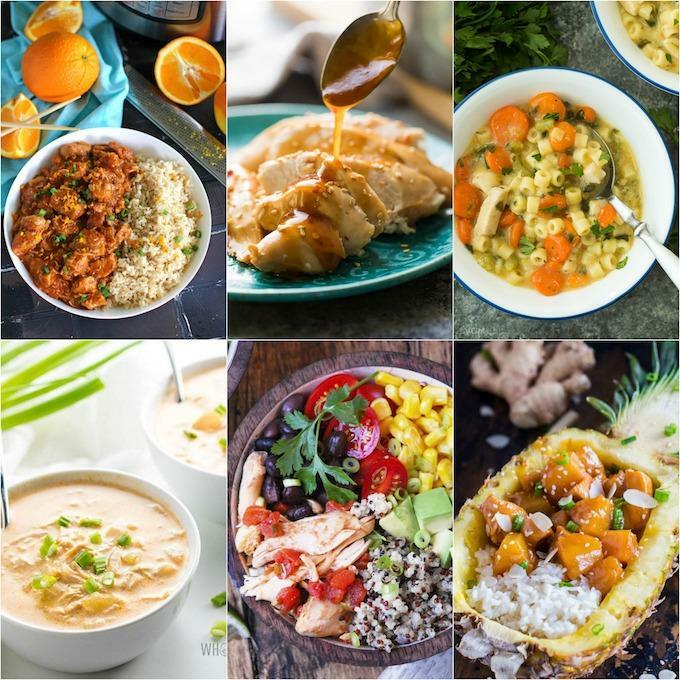 I’m going to pick some topics that you guys ask for frequently and then pull together a collection of recipes (both mine and ones from my blogger friends) so that you have a bunch of recipes all in one place that you can browse, save and try! Instant Pot Chicken Marsala – a classic dish that’s perfect for a fancy date night in or dinner with the family! Sweet Potato Chicken Chili – perfect for game day and the leftovers are even better. Cilantro Lime Chicken – packed with flavor, great in tacos or over rice. Instant Pot Thai Peanut Chicken Soup – try some new flavors in this easy soup recipe. Instant Pot Shredded Hummus Chicken – perfect for nachos, wraps and mason jar salads! Instant Pot Asian Chicken – one of our all-time fav family dinners. Instant Pot Risotto with Chicken and Mushrooms – much easier than stirring constantly! Instant Pot Asian Chicken and Rice Soup – give comfort food a little Asian flair! Paleo Chicken and Broccoli – serve it over cauliflower rice to keep it paleo or regular rice! Pressure Cooker Chili Lime Chicken Thighs – thighs are perfect for the IP. So juicy and flavorful. Instant Pot Chicken and Dumplings for Two – perfectly sized to just serve two! 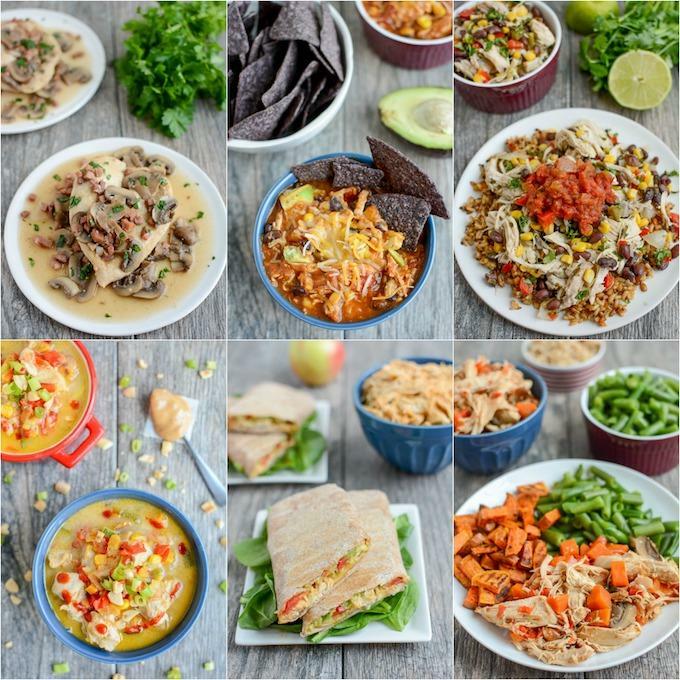 Instant Pot Chicken Tortilla Soup – a Mexican favorite that can be served spicy or mild. Instant Pot Orange Chicken – skip the takeout and make it at home! Instant Pot Honey Sesame Chicken Breast – great for meal prep. Creamy Instant Pot Chicken Noodle Soup – for those cold nights when you don’t really feel like cooking. Low Carb Buffalo Chicken Soup – if you’re not in the mood for wings, get that buffalo flavor you like in soup form! Instant Pot Chicken and Quinoa Bowls – like Chipotle, but cheaper and just as easy! Instant Pot Pineapple Chicken – a flavorful dish with a stunning presentation option. Did something catch your eye? Pin this post for later and share with friends! Yum to all of these! Making chicken in the instant pot is my SUPER easy go-to!